This is the updated OP. Our apologies it took so long to get done, and for being kind of quiet for the past week. We've had our heads down working on all the goodies announced in the post below, and some other things coming down the pipeline. We will not be posting a roadmap today, but we will be sharing what's ahead over the coming weeks. We understand that we need to communicate more and be more visible. You have our word that we will be doing so going forward. One of the members of the community stepped forward and offered a 35000ASN bounty for a new logo. Thanks go to user8x8. We're going to go ahead and run the contest starting now. Make your entries by posting them in the thread below. The contest will run for about 1 week. All of the entries will then be posted in a poll, and the logo that gets the most votes will become the new logo. The ASN team reserves the right to disqualify an entry if it is a copy of an existing brand, or is obscene. If you wish to include proposed new graphics for the wallet splash screen and twitter background, you are free to include those as well. Thank you for the support and good luck! Two seed-nodes are hard-coded into the wallet. Add-nodes in the conf file are not required. We're not big believers in making a lot of hype and noise without substance. We prefer to work on features and services until they're completed and thoroughly tested, and then release them. We'll be better communicating what's incoming from now on. We'll listen to feedback. We'll keep working hard for the ASN community. Achievements, News, Features and Services will be listed below as added. March 17- PoW ended at block 8500. 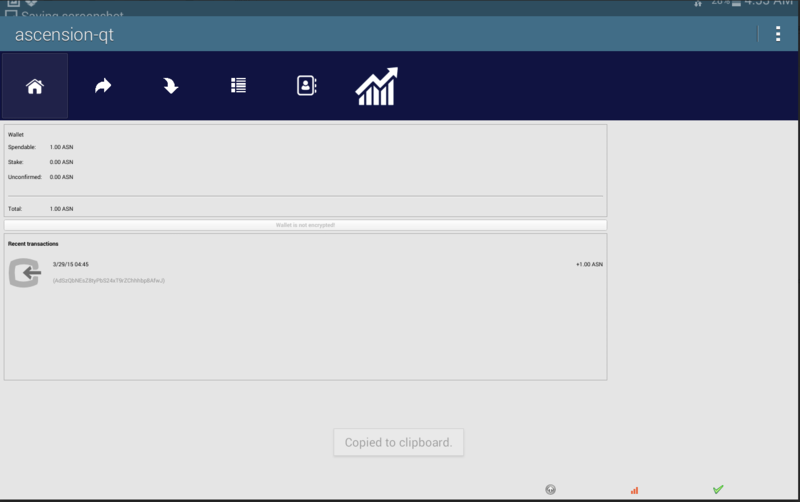 March 20- Restyled base wallets released. 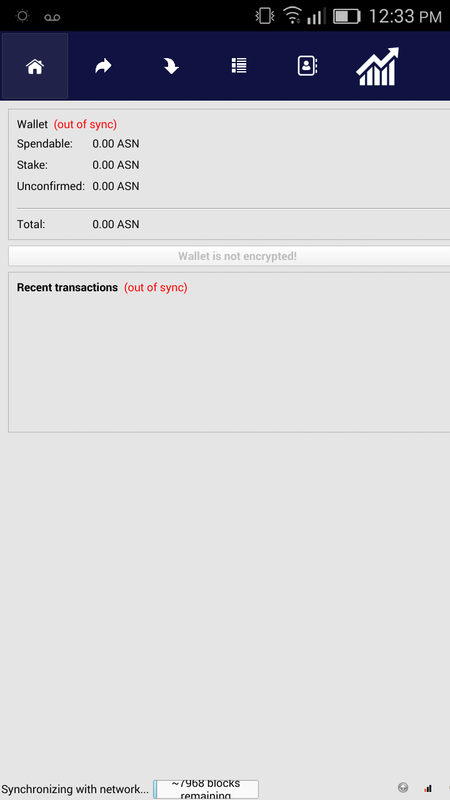 March 28- Android wallet completed. March 29- Revamped Original Post. March 29- Block explorer in wallet released. March 29- AscendChat encrypted chat in wallet released. March 29- AscendSend Coin-join tech in wallet released. March 29- Logo contest posted. WePayBTC.com algorithm-switching multipool is running a special promotion: 580 ASN per 100% payout. So AMD R9 280X will give you about 520 ASN per day, R9 290 about 580 ASN. This is very profitable, about 0.00178 BTC per day for R9 290 if you are planning to sell on bittrex or keep it and stake. WePayBTC will be processing payouts internally from wallet AJ45nABr7ZNyUXRoSxb3CADC3tyG7aBDQA. Their pool only works with AMD GPUs (no, you can't rent hashrate, you need to have your own equipment). Follow the steps here, but use your ASN address instead of BTC address. PS: Promo is running for 1 week or until ASN price is over 500 satoshi [whichever happens earlier], then the price will be adjusted. Give me a few secs ! to the list of pools ! Is it still unsynched for you? Is anywhere exist qubit rig for rent? If the block reward equals the previous block number then about 36 millions coins will be distributetd in the pow phase. PoS is running concurrently with PoW. The 8500 total blocks will be a mix of PoS and PoW. It's estimated ~5000 blocks will be PoW, the remainder will be PoS. The PoS blocks are not ascending rewards, they are a set %. Is any sites renting qubit? Can't open your link. What's happening with your sites recently. OP needs links to CPU miners algo (source and windows builds). I should not have migrated to Cloudflare probably..